André Tolmé is golfing his way across Mongolia, using only a 3-iron. ARVAYHEER, Mongolia — André Tolmé sized up the day's golfing terrain — thousands of yards of treeless steppe rolling toward a distant horizon. Without a golfer to be seen for 100 miles around, he loosened up at his own pace, taking practice swings with a 3-iron. Then, with a powerful clockwise whirl and a satisfying swak! he sent the little white ball soaring far into the clear blue Mongolian sky. "I feel good about that shot," Mr. Tolmé said, intently tracking the ball until it disappeared from view. "You could just hit the ball forever here." In a sense, he is. This summer, Mr. Tolmé, a civil engineer from New Hampshire, is golfing across Mongolia. Treating this enormous Central Asian nation as his private course, he has divided Mongolia into 18 holes. The total fairway distance is 2,322,000 yards. Par is 11,880 strokes. "You hit the ball," he said, explaining his technique in a land without fences, a nation that is twice the size of Texas. "Then you go and find it. Then you hit it again. And again. And again." André Tolmé (far right) interrupted his Mongolian golf outing at the town of Arvayheer to conduct an impromptu clinic for some local children. Moving across the rolling steppe, he is walking a route favored almost a millennium ago by Genghis Khan. The fairway may be something less than manicured, but to the north are Siberian forests and to the south is the Gobi Desert, one of the world's largest sand traps. With his caddy, Khatanbaatar, carrying water, food and a tent in a Russian jeep customized with an upholstery of hand-woven rugs, Mr. Tolmé teed off May 28 and calculates he will finish his game in the trading center of Dund-Us, which is also known as Khovd, sometime around the end of July. That a lone American, armed only with a 3-iron and an easy, impish smile, can golf across Mongolia reflects several factors: the friendliness of largely Buddhist Mongolia to Americans; Mongolia's geography of vast expanses; and a new extreme golf movement that is prompting young Americans and Europeans to break way out of country clubs. For Mr. Tolmé, 35, it is also a summer adventure: a night listening to a chorus of howling wolves; standing dumbstruck as children race horses down the steppe toward him; enjoying the hospitality of the nomads, drinking fermented mare's milk inside a yurt; and watching as sheets of rain and lightning bolts march down the open plain. Alone under Mongolia's big sky, André Tolmé is playing golf on a course that is twice the size of Texas. "Hey, I watched the movie `Caddyshack,' I know to keep my club down when there is lightning around," he said. A few minutes later an early summer hailstorm struck, driving him into his jeep. To Mr. Khatanbaatar, Mr. Tolmé's golfing style is a bit of a mystery. "I don't know anything about golf, but what I saw on TV, they put the little ball in a little hole," said Mr. Khatanbaatar, a retired soldier who still wears camouflage military fatigues. Mr. Tolmé, who learned rudimentary Mongolian while golfing across the eastern half of the country last summer, explains that he considers each major town to be a golf hole. Pocketing the ball upon arrival, he walks through the town and then tees up on the other side. "I only use the tee when I start a hole," Mr. Tolmé said, adding that he plays by "winter rules because Mongolia can be often cold." Last summer, Mr. Tolmé teed off on June 5 in Choybalsan, an old Soviet Army garrison town in Mongolia's far east, facing the Chinese border. Fifty days and 352 lost balls later he surrendered to nettles and high weeds and halted his march in this interior town, his ninth hole, a place described in the Lonely Planet Mongolia guide as of "little interest" with "dreary hotels." During the Naadam festival held on July 11, Mongolian National Day, Mongolian people gather in a large open area of the river plain near its capital Ulaanbaatar. 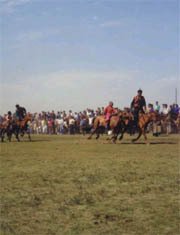 Mongolia's three main sports of horse-racing, archery, and wrestling, are held during the three-day festival. 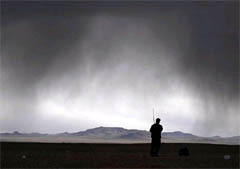 But Arvayheer is about 100 miles west of Mongolia's geographical center, and Mr. Tolmé is confident that, about 5,000 strokes from now, he will putt his last ball into Dund-Us, reaching a Western Mongolian destination popular with tourists for its deep lakes, high mountains and fast rivers. Guided by a hand-held Global Positioning System device, he expects to golf about 10 miles a day, skirting mountain ranges and passing sites like crumbling monasteries and a dinosaur bone quarry. Mr. Tolmé's only deadline is to beat the late July rains and the subsequent weed explosion. On the steppe, one of his greatest pleasures is meeting people. Alone under the big sky, chatting occasionally with sympathetic sheep, he now places a new value on human relations. "I am amazed at how easy it is to live very happily with very little, without gadgets and toys," he said as he bounced along a potholed road leading from Ulan Bator, the capital, to here for his second summer tee-off date. "When I meet people living in a yurt, simple homes in the countryside, they laugh, they joke, they all know how to have fun." 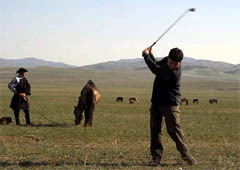 Mr. Tolmé's Web site about his adventure — www.golfmongolia.com — is filled with amiable encounters with nomads: a pair of teenage boys teaching him how to shear a sheep and how to hobble a horse; free golfing lessons that left a few more rock scratches on his 3-iron; and major drinking sessions that left everyone fast asleep in a cozy yurt. The human encounters, he said, more than made up for the flies, the blisters, the sunburn and the poisonous snake that once curled around a ball, protecting it as if it were an egg. "When I say I am American, the universal response is, `Ah, American, very good country, we like Americans,' " he recalled. Part of the response is geopolitical. 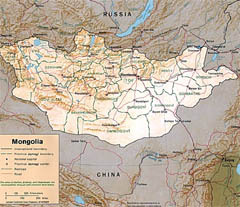 Treated as a colony of China for hundreds of years, Mongolia won its independence in 1911, only to fall a decade later under the Soviet orbit. Today, the Mongolian government cultivates friends beyond Russia and China. Many Mongolians are followers of Tibetan Buddhism, and suspicion of China is high. There are signs that Mongolians are awakening to their golf potential. Last year in Ulan Bator, the first golf course opened, complete with horse-mounted caddies who charge after balls, marking their locations with flags on arrows. Last month, the first indoor driving range opened, also in the capital, which was Mr. Tolmé's sixth hole. But, some argue, Mongolia could skip the country club phase of golfing, and embark directly on cross golfing, a populist new trend for hitting balls through unorthodox settings like city parks and streets. With an open, rolling countryside and fairways cut by roughly 30 million grazing animals, Mongolia is ideal for the casual backyard duffer. Here at a roadside yurt camp, a Mongolian man named Bayara looked at one of his five children preparing to take a hack at the ball and predicted, "Within a few years, these kids will probably be holding sticks of their own."